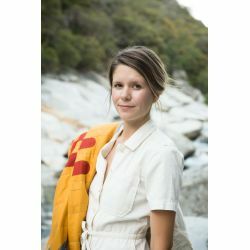 "Modern minimal textiles inspired by travel + handmade in a mobile Airstream studio"
Laura Preston is a designer, artist and the founder of Vacilando Quilting Co., a mobile quilting and textile studio. She’s been living, working and traveling around the United States in an Airstream trailer since 2013 with her husband, two dogs and cat. Vacilando was born on the road in 2015 - each quilt is designed and pieced in the Airstream studio/home she and her husband designed and built from scratch, then sent to one of the home-based quilters she works with to complete production. Her handmade heirloom-quality quilts are inspired by travel, specifically resonance with places and natural + built landscapes, with the aim to refresh and modernize the tradition of craft. Meet This Maker: Laura Preston of Vacilando Quilting Co.